There are a number of products I eat/trial on a regular basis that don’t really warrant an entire blog post so I have decided to have a monthly product wrap-up. This month I thought I’d run through a couple of products that I eat on a daily basis. Bread is one thing that never seems to be the same when it is gluten free, however luckily for all the coeliacs and gluten intolerant people out there, there are a couple of companies that have produced some breads which are getting closer. 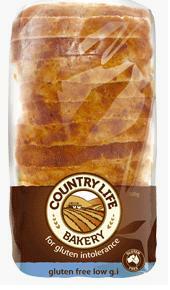 One of these is Country Life who have a number of varieties including white, multigrain, fruit, sunflower linseed and the one that I like, the low GI. I have a slice of the low GI bread toasted for morning tea with a slice of low fat Jarlsberg cheese. I find it best if you toast this bread, even if it is fresh (which it only tends to be for about a day) as it tastes a bit better this way. Jalna have a number of flavours of yoghurt of which I have tried the premium vanilla, premium honey vanilla and the fat free natural. My favourite is the premium honey vanilla however I also love having the fat free natural yoghurt with defrosted frozen berries. This is a great gluten free and healthy snack! These bars are great to have as a snack on the run, and provide you with your daily dose of nuts (almonds in this case) which are good for you in many ways including heart health and helping to maintain a healthy waistline! In the Natures SuperFoods range there is also a brazil nut walnut & date flavour however I prefer the almond cranberry one.